The photo gallery of the SNU Rally at Fort Churcill is up! At the orchard across from Buckland’s station and Weeks. This was the site of one of the first toll bridges on this section of the Carson River. What’s funny about fullduplex.org » Living in 2006 is that several items on this list came up at the last SNU Rally. You may have another month or so, then again maybe not. Sometimes a good hard freeze doesn’t happen in the Great Basin until December or later but from October on out you are playing the odds. Its when the average of the daily minimum and maximum temperatures goes below 30F or you have most of the night at hard freezing temperatures that you really have risk of freeze damage in your RV. You’ve got three kinds of plumbing risks. The small things like faucets and valves and the big things like tanks and then the special stuff like filters and accumulators and pumps. Blowing out the lines with compressed air is a popular technique. Its problem is that it can leave small amounts of water in valves or dips. Most of the time this isn’t a problem, especially if all the valves are left open and given a week or two to dry out. An antifreeze fill is always a good idea as it will replace the water without having to depend upon what might happen. Seals and gaskets drying out might be another reason to keep the system wet with antifreeze. The large things should be drained and isolated (e.g. water heater bypass). Usually a bit of water in them isn’t a problem and antifreeze really isn’t needed. Traps should be well enough protected by the pink stuff coming out of the valves when you make sure you have antifreeze throughout the pressure side of the plumbing. They too will dry out in a week or two usually. The taste thing in the spring goes along with the sanitatizing exercise. Residual taste says you need to improve your flush technique. By the time you’ve flushed the antifreeze then hyperchlorinated then flushed you shouldn’t be tasting the antifreeze. Do be careful when attaching pressurized air to the system as it is easy to overpressurize. Also keep in mind that many air compressors tend to produce ‘dirty’ air that may flavorize or contaminate a system. Sometimes a couple of gallons of antifreeze in the water tank over winter can be useful to allow using the toilet. Other than that, your fresh water supply is best from bottles. Also see the owners guide on Winterizing, Warmth, Catalytic Heaters and don’t forget the Mice. Reports indicated some snow earlier this week towards the south as the front went through. There was some rain to the north and in the elevations below 6000 feet. Temperatures have created some good frosts but nothing that should threaten RV systems. A high is building into the area that should yield warming temperatures through Friday. A slight cooldown is expected Saturday but conditions should remain dry. Starting Sunday we may see some clouds as things get mixed up again with the atmosphere trying to figure out whether its winter or not. The apple orchard across Alt 95 from Buckland station is still the target for the weekend rally site. It should be a good weekend to explore the Carson River Ranches area. When you are comfortably in your career or just past retirement and have the time and resources to really enjoy your RV, you may also be facing care of your parents or your children’s college or both. You are also facing your own care down the road. Business Week Online has a special report about preparing for aging parents. The articles are short – no more than an expanded checklist, really – but well worth perusing to see if you have overlooked anything or haven’t considered some issues that have important consequences. You need to be able to enjoy your time with yourself and with your friends. Assuring proper care of your parents is one worry you can handle so you don’t have to take it with you RV’ing. Starting about this time of year anyone doing anything outdoors in the Great Basin keeps a keen eye on the weather. While forecasting is getting better, especially for large scale storms, any predictions more than few days out can have enough uncertainty to make a difference in plans. You can view the typical temperature forecasts with precipitation probabilities or you can see what the meteorologists are thinking such as at the National Weather Service Forecast Office weather discussion. Models similar in keeping ridge in ERN PAC with S/WV energy diving SEWD across WRN Canada into Rockies. Heights remain high enough and jet far enough E to keep area under dry acyclonic N-NE flow. Some minor differences by weekend with Euro showing more zonal flow across ERN PAC while other MED range models more amplified. Little change in AFTN temps which should be around 5-10 degrees above normal. Inversion forming overnight for cooler valleys and milder mid slope temps. What this means is that some lumps and bumps in the atmosphere that are producing winds and a low front are passing by the area to be replaced by a more regular fall high pressure pattern. Temperatures in the afternoon are likely to be a bit above normal (40-70F for Silver Springs area) with a potential for some damp mornings. Those heading up and down US 395 on the Sierra slopes should also have mild temperatures considering the season. Those “models” are mathematical models of the atmosphere that are used to extrapolate what it will be from where it is now. Some are better for short range and some for medium range forecasts. Long range is something akin to a wild imagination in this business. Meteorologists have a few favorite models whose predictions they compare and contrast with each other so they can get an idea about how well behaved the atmosphere is at any time. The model output is then considered with local climatology and maps made from current weather observations to guess at what might be the weather in a few days. There is no substitute for being prepared. A minor storm may turn out to be a major one or you may encounter some very localized extreme. Carry traction devices (chains) and warm clothing. Let people know where you are going and don’t take unnecessary chances. One of the natural world’s most breathtaking sights – the pink and crimson clouds of flamingos that flock over East Africa – is under threat. At this rate, pretty soon all we might have is our memories and memorials of The Pink Flamingo! The Nevada All State Trail Riders seem to share some common interests with the WBCCI SNU. They may not be the organization at Scout Camp on rally weekend but their interest is clear. NASTR…Carson River Ranches describes their efforts along this stretch of the river. The trails project includes clearing and signage for seven trail heads, a rest room and horse corrals, camp areas and approximately 30 miles of trail connecting the two State Park units, as well as BLM lands. The trails will accommodate non-motorized users, equestrians, hikers, 4-h campers, hunters, mountain bikers and educational activities and canoeing on the Carson River. The equestrian set also finds Ramhorn Springs and Meadowview Camp, two other SNU type sites, as places to go for a ride. Boondocking (Free Camping) is a catalog of GPS coordinates that may help you find places to camp far enough off the beaten trail that nobody worries about collecting fees. It is a user created database so its quality is in the hands of those who provide information. Boondocking Guide is Pat Water’s attempt to spread the wealth. He is a Canadian who bought a motor home and now spends most of his time in Southern California and Arizona BLM dispersed camping areas. He’s got pictures and some good information. Be Prepared is the NOAA hurrican preparedness site. Its for those who end up boondocking without leaving home. It may have some good advice for handling unexpected circumstances when you can only depend upon yourself. Indians and Their Wars in Nevada Part 1 (1881) might be a good place to start if you like to dream about the ‘good old days’ (note that the Civil War re-enactors won’t be at Ft. Churchill this fall). It looks like the Washoe Tribe was prevalent along the Carson River in the mid 1800’s although The Pony Express and the Pah Ute War indicates there were other tribes. This particular history is somewhat sympathetic to the Indians. Perhaps one reason the Carson River near Fort Churchill interests the equestrian set is that it has a rich Pony Express History. Nevada Division of State Parks – Fort Churchill State Historic Park is a good start (and other park information). Bonus.com® has a map and a rundown on Buckland station. Pony Express NHT: Historic Resource Study (Chapter 8) provides a list of stations along this stretch of the route to provide an historical perspective (see the Table of Contents for a lot more on the history of the trail. Pony Express Trail is the story from the Great Basin Heritage Area Partnership. The Silver Springs Chamber of Commerce is another site worth perusing. Their Buckland Station page provides a concise history. The State of Nevada has some big ideas. 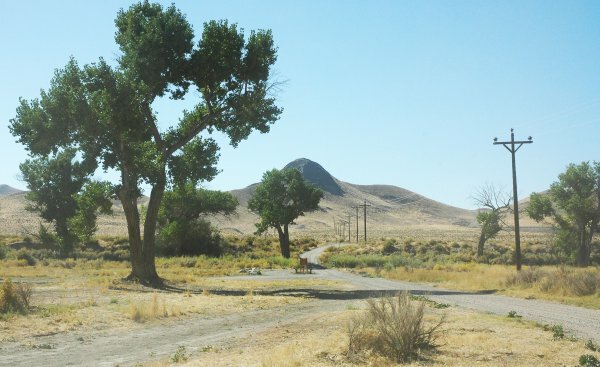 The Carson River Ranches is one effort to connect Fort Churchill State Historic Park and the Lahontan State Recreation Area with a public use area along the Carson River. Dayton State Park is a bit upstream of these near where the Virginia City gold ore was processed. The mercury residue from that activity is still present and results in cautions not to eat fish caught in the Carson River. The USGS Activities in Nevada site has a new report USGS Flood Chronology of the Carson River Basin, Nev. and Calif. as a good place to investigate the range of the basin and its floods, such as occurred in the Spring of 2006. (The USGS Activities in Nevada Weather and Road Conditions page is a good portal for weather and road conditions sites, too). Weather.com has a list of nearby recreation areas with links to current weather information. NV10123 – Lahontan Dam – Nevada provides the rundown with specifications and a geological rundown. The picture here is typical of the ranchlands along this part of the Carson River. There is a river channel with banks a couple of meters high that is much larger than the normal than normally occupied by the river. It is a shallow canyon cut into the playa. Camp Scout, shown in the Carson River Ranches photo gallery is in the canyon. Some of the pictures show the entrance road dropping off the playa or, as in this picture, rising out of the canyon. This is ranching country but you cannot expect to graze a lot of cattle per acre on this sort of land. The ranger called today and promised to have the gate open to the apple orchard Thursday. This gate is off Alt US 95 and just across from Buckland station on the north side of the Carson River. Signs will be posted early Thursday afternoon, maybe. Otherwise you will have to exercise your ability to pass the SNU IQ test and figure out by yourself where the gathering is gathering. There are no defined camping places and SNU Rally participants are welcome to camp pretty much where they think best in the area. Do be aware that there is a culvert a bit down the road that might not be suitable for heavy vehicles. There are abandoned buildings on the site. It would be a good idea to stay out of these because of the risk of creating further damage and being in the middle of something increasing entropy. There are also a number of rusting farm implements that should be in the “look but don’t touch” category. Between falling apples and low hanging branches, it might be a good idea to keep trailers out of the orchard. The river is on the other side of the orchard from the road and pasture with access through a barbed wire fence. The three county equestrian gathering is about a mile downriver at scout camp (see the Carson River Ranches photo gallery). The old Ft Churchill and improved camp area is about a mile upriver. If a storm comes by with a lot of rain or the site looks just a bit too rough, we might end up camping at the Ft Churchill improved campgrounds anyway. Its nice to have backup. State park fees will apply either way. ($10/rig/night or permit). It would be a good idea to call SNU HQ at 775-972-5011 if you plan to attend. Depending upon Verizon service, there might be a cell phone number to call if you need help and don’t want to wander around with your trailer in tow looking for an Airstream gathering. Be sure all valves are tightly closed. Use a “POL” plug to seal all valve openings when not connected. Routinely inspect propane cylinders for damage before using them. Do the “sniff test” before use or storage. Store propane cylinders away from extreme heat or a source of ignition. Be sure propane cylinders are properly labeled. Have a propane dealer inspect cylinders for retest dates, damage and leaks. When there are cold frosty mornings and the sun just starts to hits your tank, you will often see frost only only the bottom of the tank where the liquid is. This is one way to tell just how full your tanks are. If a frost line doesn’t do, you can poor some hot water down the tank and feel where the temperature change is. The liquid propane absorbs heat much faster than the gas so you will feel the colder temperature where the heat was absorbed by the liquid propane. Mid West propane has a guide to an Emergency Procedure For A Propane Leak with the kind of common sense advice that often seems to be beyond comprehension. For specs on Manchester’s aluminum marine tanks, see the link. Marksrv.com lp facts page is where you can find about the differences between propane and butane and that your typical 30# RV tank has 646,440 BTU’s of energy. It would take nearly 200 typical group 27 batteries to store an equivalent amount of energy. (see the Unit Conversion Tables to help compare things like this). Rivets, metal sheets, and the tools you need for them can sometimes be rather difficult to find. Genuine Aircraft Hardware Co. is one place to find some of these things. You can also find ideas such as the Rivnut Assortment kit. Don’t know what a rivnut is? Check the docs. If you don’t want to wait for technology to catch up to you, you can see about HOW TO – Build your own band aid fuel cell at the Make Blog. For hydronic heating and instant hot water, check TwinTemp which is oriented at those big class A’s. And to help with the documentation and manual shortage, there is a free LP gas service manual – RegO® Products LP-Gas Service Manual. There are a lot more manuals and tutorials available for electrical systems. See RV Electric for example. If you are looking for an alternative Kill-a-watt, check out Watts Up? Products! Instructables: step-by-step collaboration is a place where people share what and how they make things. It might have some ideas for you. If your ball mount shank rattles around in the hitch receiver, check out the Eliminator-Anti Sway Bracket by Surco as a solution. If you want to know how traffic devices, such as speed limits, are supposed to be set, check the MUTCD Millennium Edition with incorporated Revision Number 1 changes, dated December 28, 2001 – FHWA MUTCD. This is the manual that tells your state DOT how to do things if it wants federal highway funds. And if you have some other good resources for parts, pieces, fixing things, or being creative in making things, pass ’em along. Hwy 395 Waypoints atClimber.Org Driving Directions for Eastern Sierra Trailheads and Junctions accessed from Hwy 395 marks common places to TURN OFF from Hwy 395 (black text), and the actual TRAILHEADS where you start hiking (red text). The waypoints are listed north-to-south, starting at Minden near Lake Tahoe in Nevada and ending near Inyokern in the Mojave desert. Our last rally of the year. Friday – Sunday October 20 – 22 2006. Thursday October 19th will be a bonus day, so if you can come on Thursday – fantastic! * Please Note: We have changed the venue for the October Rally. It will still be at Ft Churchill but not at the regular developed campground. After talking with the Ranger, we will probably be holding our rally in the “Orchard” which is right off Alt 95 across the road from the Buckland Station Historic Site. This is an undeveloped area but sounds perfect for the SNU. It is right on the river and near some old apple trees. Signs will be posted. * Special Treat: The Ranger also said he would treat the rally participants to a special tour of Buckland Station. This is an historic building right on Alt 95. It is not generally open to the public. Thanks to those of you who have already renewed your membership for 2007. We hope the rest of you will renew soon or if you are not currently a member, now is the time to join. You have several payment options. Airstream 1960 Safari – Here’s one Dean wants to sell. It needs a bit of work but the interior is ‘original well worn’ – it has hydraulic brakes so that will need updating, too. And don’t forget to clean the bird’s nest from fridge vent. It is interesting that the fridge vent is not totally isolated from the inside living space. 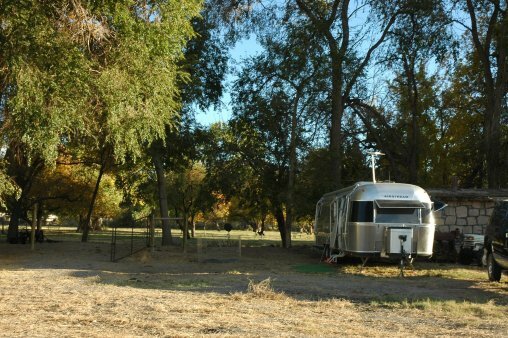 Airstream Classic 2006 – A brand new trailer on its first dry camp experience. Sierra Nevada Airstreams Destinations – U.S. 95 – the index page to places up and down the center of Nevada. You’ll find a link to the photo gallery of Scout Camp at the Carson River Ranches section of Fort Churchill State Historic Park. Buckland Station is a pony express stop right at the river that is being restored as a part of a Nevada State Parks project to link Lahantan and Fort Churchill parks with trails and nature areas along the Carson river. SNU was considering Scout Camp as an October Ft Churchill rally site but it appears there will be equestrians from three counties gathering there the weekend of the 20th. So the ranger says the Unit might be able to dry camp in the apple orchard and get a special tour of the pony expression station currently being restored.